As DRIVER‘S BEST FRIEND we offer 24,000 solutions to make vehicles around the globe perform longer and more reliably so that motorists all over the world can safely rely on MEYLE quality. Brilliant aesthetics that stand the test of time! 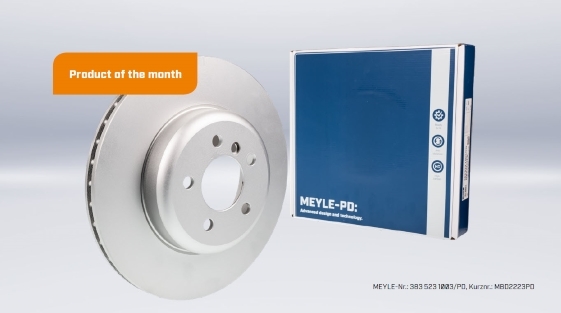 While other manufacturers produce brake discs from two components – aluminium bell and cast steel friction ring – the MEYLE-PD brake disc for BMW applications is manufactured from a single steel casting, which makes it possible to coat the entire surface, preventing oxidation and corrosion. 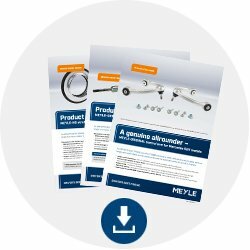 Top performance in a new look – As one of the leading manufacturers of automotive spare parts, MEYLE takes its responsibility very seriously: it goes without saying that MEYLE brake discs are tested and certified in accordance with the ECE R90 quality standards and thus fulfil the highest safety standards and OE parameters. With the new singlecomponent brake disc, MEYLE offers once again a reliable brake partner for optimal performance – also in a new design! High carbon, high class – High-carbon MEYLE-PD brake discs are more heat-resistant than conventional discs: a higher percentage of carbon makes the brake discs more torsion-resistant. They can withstand higher temperatures and prevent thermal vibrations. High-performance range – The range will be further expanded throughout the year and comprise a total of 14 new brake discs, thus covering over 5 million licensed BMW vehicles. the "Product of the month" as download files.